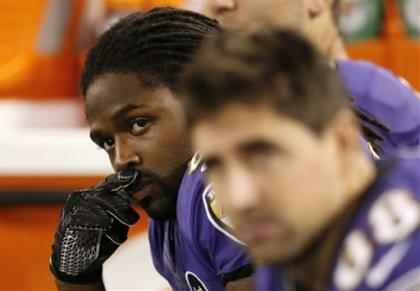 BALTIMORE – On the afternoon after his brother died, Baltimore Ravens receiver Torrey Smith arrived at M&T Bank Stadium long before any of his teammates. He walked through a set of steel double doors painted black and into the empty home locker room. It was 5 p.m. on Sunday. The NFL's afternoon games were barely in their second quarter. The Ravens' game with the New England Patriots wouldn't kick off for more than 3½ hours. But on a day of tumult, a day of misery, a day that began with news of a motorcycle accident in the middle of the night and was filled with a drive through the darkness to see his family and then back to Baltimore, this was his solitude. This was where he could be alone. "I'd be one of the first guys too," Ravens running back Ray Rice would later say. Inside the sanctuary of the locker room, Smith took off his red button-up shirt, blue jeans and tan work boots, pulled on a white Ravens T-shirt and prepared to play the game they will forever remember around here. On the night after Tevin Jones was killed when his Honda motorcycle crashed into a utility pole on Route 672 in Westmoreland County, Va., Torrey Smith caught six passes for 127 yards. Two of the catches were touchdowns. After the first, which was a tumbling grab of the football in the northeast corner of the end zone, he knelt on the turf and as the crowd roared around him, he bent his head and prayed for the brother who would not be in the stands. After the second, the Ravens would be two points behind the Patriots in a game they would win at the last second on a field goal. "A pretty special guy," Ravens coach John Harbaugh would later say. "It seemed like his brother was running with him tonight," Rice said long after the game was over. "It seemed like he had a little extra pep in his step." Rice looked across the locker room, which was crowded with players and reporters and team officials and he shouted to Smith. Then he raised his fist. It was unclear whether Smith, who was talking to a group of Ravens executives, heard him. But somehow he knew the affection was there. What is it about sports that propels men to have great nights like this when all seems wrong? Several of the Ravens players said they would have understood if Smith had not played. Many surmised that if it was their brother they probably would not. The pain would be too fresh, the hurt too deep, the shock too much. Smith never seemed to consider it an option. He told Harbaugh early on Sunday morning that he would be back for the night's game. Harbaugh refused to take it as a commitment, but then there was Smith, several hours later at the team's chapel service which Harbaugh said he heard was "emotional." Then he was at the team meal where he sat sadly as teammates and coaches patted him on the back. He said he had slept for only an hour. He worried he wouldn't be able to concentrate. He wasn't sure he would be much help to the team. When he was with his family on Sunday he didn't tell anyone how he felt about playing. It wasn't time to talk about that. He didn't decide until 4 p.m. He texted his mother, Monica Jenkins, to tell her. She told him Tevin would have wanted him to play. On the day his brother died, Torrey Smith received dozens of texts and emails from players around the league. Many of them he didn't know. This moved him. If players from rival teams, like the Pittsburgh Steelers, told him they were thinking of him, how could he not play? 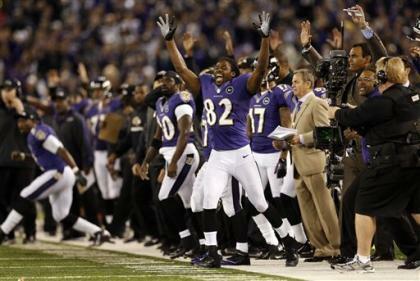 The Ravens told him they wanted to have a moment of silence for Tevin and Smith was overwhelmed. "That touched me right there," he said after the game, "the fact that the organization took the time out to honor my brother, one of my family members who had absolutely nothing to do with the program … "
He shook his head. His eyes were red. He looked exhausted. "It meant a lot when they came up and told me," he added. "It was kind of a shock." This has been a hard life for Smith who endured a lot to get to the NFL. Two years ago The Washington Post profiled Smith just after he graduated with a criminology and criminal justice degree at the University of Maryland. The story told how his mother, who gave birth to Torrey at 16, leaned on him to help raise his seven brothers and sisters while she worked two jobs and took classes at a community college. At age 7, Torrey was making meals for his siblings, the story said, heating up food in the microwave by setting the buttons at places she had marked in pen. This earned him the family nickname of "the Microwave King." For years he changed diapers, got everybody dressed and out of the house and to school while at the same time developing into a star athlete himself. While Smith was at Maryland, Monica was sentenced to six months in jail after a fight with her sister-in-law. But somehow they survived all the bad. Smith became a second-round draft pick of the Ravens in 2011 and became the team's best deep receiver. They had come through intact. Now this. Smith planned on hosting his brother over the weekend of Oct. 6, when Tevin would have turned 20. "It's hard to explain," Smith said after the game when asked about Tevin. "You had to be around him. He's honest. He had a great heart. A lot of people say that all the time when people pass but he truly was that person. When you see him mad, you'd always laugh because it didn't look right. So to be around him, his big smile and his laugh – which was probably one of the most annoying laughs ever – I'm definitely going to miss him. "He laughed so hard at everything and you know he'd do anything for you. It's a tough loss for us." It was now two days after Torrey Smith's brother died and the Ravens had beaten the hated Patriots in a game that felt like redemption for the AFC championship game to the 71,289 in the stands. Smith looked around a filled media conference room below the stadium and sighed. He was still dressed in his uniform. "My teammates, I love them to death and they helped me get through this," he said. Then he stepped away from the lectern and walked past Harbaugh and through the steel double doors painted black and into the one place that had kept him sane. • Week 4 Winners and Losers: Safe to say Florida State is back?